Welcome to Hands on History! The Roman workshop, like most of Hands-on-History presentations can be held in either a large arena or offered in parts as singular workstations in a multiple of rooms or over the course of several days. Schools have the option of choosing from a host of tasks and assembling their own shopping list. Here, in brief, are the Roman options. Roman coins are always fascinating to young minds and hands. Using a time line of Greek and Roman history as a guide, authentic silver and copper coins, valued at thousands of dollars are placed in their hands to enjoy and evaluate. Holding two thousand year old coins has made some students literally pass out so we do this presentation on the floor, for safety and control. One silver coin was minted the year Julius Caesar was born….and it says so. We show your kids how the Romans marked and dated their coinage, and how we must play detective to interpret their system to our dates. The Roman soldier was the most formidable military man for nearly a thousand years. We dress some of the students up in replica uniforms and make them a soldier for the moment, allowing all the students to handle the equipment and material weaponry of the period. 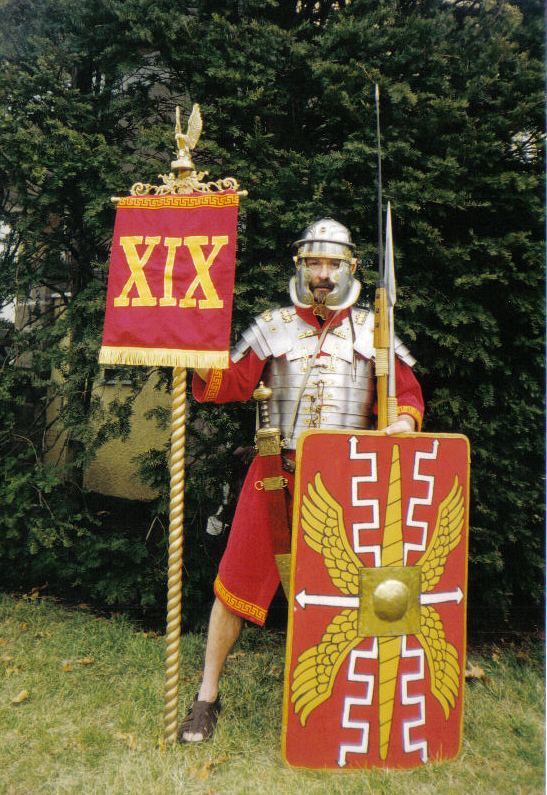 From body armor, to swords, chain mail, helmets, sandals, shields, and spears, its all hands-on with a focus on he daily life of the roman soldier. Safety first, with lots of controlled management. The Infantry capabilities of the Roman Army were the foundation of all massed troop warfare, making the study of their troop formations and battle tactics essential to understanding to power and grandeur of the Roman Legions. 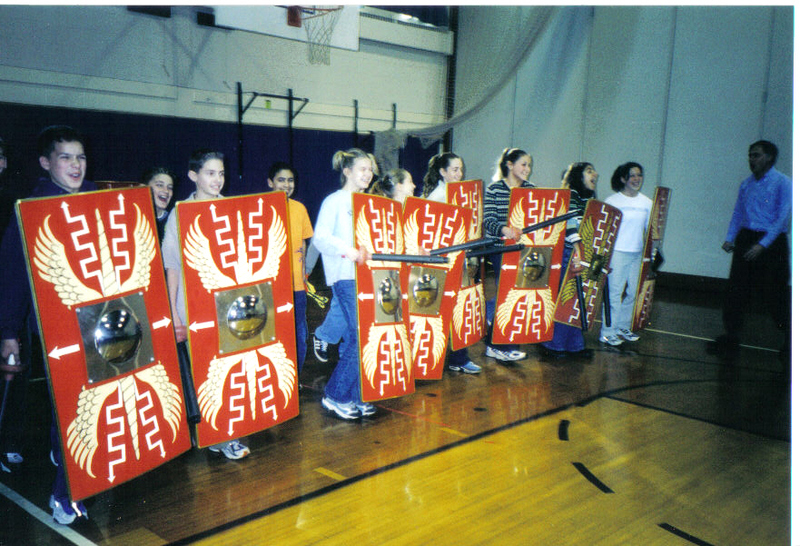 Students are arranged and massed as legionaires in formations, are taught to march in battle order, and use large wooden shields and faux spears to simulate battle techniques. With the help of a carefully guided task booklet, students will assemble a mobile catapult. The frame, wheels, ropes, and sling arm all work and the students will be expected to throw various objects using both the standard arm and the sling. As builders, one of the most important contributions to architecture was the Roman Arch. We have two arch programs which allow the students to build in a multiple of fashions. Each requires teamwork, focus, and a commitment to completion. Acting as live scaffolding the building teams must cooperate with one another in order to succeed. One of the arches should be built by spanning an eight foot distance, raised on two columns, four feet high. Lots to learn here. Roman water projects were as famous then as they are marveled at now. One separate program, Roman Water, traces the development of a water supply system from the point of origin to the end user and waste system. Students will build a ten foot long, eight foot high, three tiered ached arcade which is the everlasting symbol of the Roman aqueduct. The Romans are historically applauded as the ancient world’s best bridge builders. Two water stations have your students building a floating ‘pontoon’ bridge and a stick built, 'pile' bridge. Very detailed teamwork and communication, using task booklet instructions, guide them to success in these challenges. Model soldiers, horses, and carts pose as logistical questions for movement from one shore to another. The numbers and speeds are astounding. A singular large group exercise in a large room is the Roman Arena workshop. Still a work in progress for the actual printed cloth arena, students are seated in multiple half circles facing the Gladiator training pole, and are introduced to the various forms of Roman Gladiators. Each student is given a character card to read out loud to the class. There are over seventy five such cards, each representing a singular aspect of the Roman Arena. A full reading gives the class a rich appreciation of the complexity and barbarity to an arena event. Authentic Roman Coliseum stones are passed around for each student to hold a little piece of history.